These were made by the talented @bulletready1 on Instagram using my most popular duct tape tutorial, the duct tape zipper pencil case. Pop Tab Hearts made by @beadaholic94 in Instagram. Sock Buddy made by @alittlebitcrafty on Instagram. This was made using my Sock Buddy Tutorial. 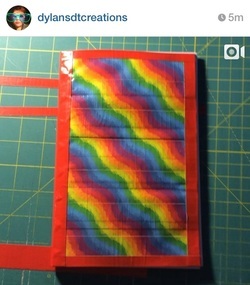 Capri-Sun Duct Tape Wallet by Manda Schumacher. This book was made by using our book binding tutorial but with a duct tape cover instead. I love it, its amazing. Origami Kinetic Mobile by Jenni Vernon. I have no idea how this was made but it sure does look pretty. 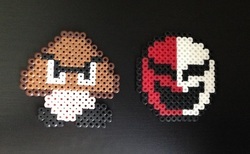 Here are some awesome Hama/Perler bead creations made from Fabiana Moen. Here are some amazing candy wrapper purses from Simona Florentina.